I’m pretty happy with how it looks to the viewer – when I was in the room it absolutely flew past compared to how I perceived other people’s talks but I guess that’s just how it goes! If you’re interested in attending or speaking at the next Ignite, check out the website! With the announcement of the General Election on 6th May you would be forgiven for thinking I’m getting all political, but not just yet – today I’m going to rage against the banks. Over the last ten years I have been a signatory on various bank accounts for Scout Groups – Ormskirk Network while I was on the Exec and currently Ormskirk Crew and Ferrets Explorer Scout Unit. 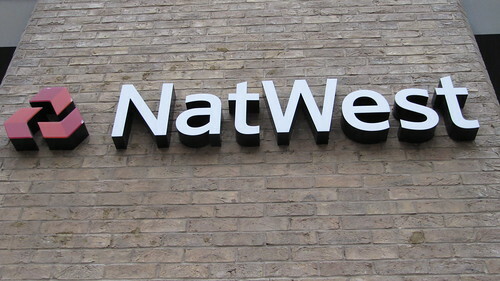 All three accounts have been held with Natwest or Royal Bank of Scotland, generally because their “parent” accounts are also held with those thanks. When leadership teams or committees change there is a process to go through to change the signatories on an account and this is the right and proper way to prevent fraud and other crimes that could be assisted by having a few hundred quid from a Scout Group but each and every time I have tried to change an account’s mandate the bank – RBS or Natwest – has screwed up. Twice in the last month I have discovered that mandates sent in last year were not processed meaning I have had to once again track down the old signatories to remove themselves and round up the new signatories to go into a branch and prove to the bank who they are. Staff in the bank are usually very apologetic but never have they been able to offer me an adequate explanation as to why it happens – “it’s just one of those things” they’d say. No. It’s not one of those things, it is systematic incompetence and it needs to be sorted out now. So would someone from RBS group’s social media team (you do have one of those, right?) please contact me with an explanation of what changes you are going to make to stop this happening again and personally take responsibility for the latest changes to our mandates – one for Ferrets’ account with RBS has just been sent in and I’ve just received forms to complete again for Ormskirk Crew’s Natwest account after the last set submitted last May went AWOL. My email address is michael@michaelnolan.co.uk. I’m waiting. Image creative commons licenced by Howard Lake. Update 7th April 2010: Received an email from a representative of HSBC offering their services. Still no reply from RBS Group.